CLICK HERE To Schedule Your Call With Coach Lee! I want everyone to know what tremendous help Coach Lee has been to me! I had been dumped and had not heard from my ex for many days. It was tremendously painful since in my past experience I had never seen the relationship be revived after being dumped. 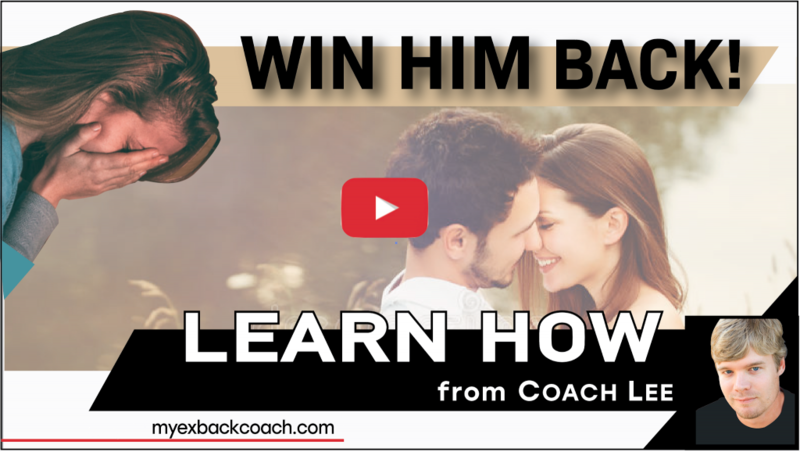 You can read about strategies which are helpful but if you are serious about getting your ex back, contact Coach Lee. Once I hired him on the case, five days later my ex called. A miracle! He helped teach me what to say and when to say it. He calmed me when I wanted to reach out to my ex but it wasn't the right time. Even when my ex went many days without calling me his vast experience gave me the confidence to be patient. You go through so many ups and downs. He knows what you are going through and calms your fears! He gives you a game plan and helps you execute it through the highs and lows. After five days of hearing from my ex, she ghosted me for 11 days. I freaked thinking now it is all over! Coach Lee helped me be strong during that time! Then my ex called back! A second miracle! We went for coffee! A third miracle! He coached me for the coffee date! We ended up getting back together and I now have a regular call with Coach Lee. He teaches you so many things that help you move the relationship forward. You don't give them what they want you give them what they need! Coach Lee will be my coach for life for the most important thing in life you have, which is your loving relationship with your significant other! -Dr. M.
The one you love has broken up with you and now you refer to them, sadly, as your "ex" boyfriend or "ex" girlfriend. You desperately want to get your ex back fast but everything you've tried, if you've tried anything, has not worked. At this point, your ex is possibly ignoring your attempts to contact them and you don't know how to get your ex back. It's as though they are someone else. It's as though the time you spent together is now meaningless to them. It's as though they have forgotten and to say that it hurts is a gross understatement. You feel anxious, nervous, and in the depths of sorrow. You are panicked, and you've found this website because you're hoping there's reason to hope. You're hoping someone can tell you what is going on and if it's possible to get your ex back to being yours again. Yes, I can tell you after 18 years in the relationship coaching and recovery industry that it is possible and there is hope. You want to reason with the person who used to be your girlfriend or boyfriend. You used to know them but now, you feel as though you don't. If only you could go back in time. If only they knew how much you still loved them, surely that would be enough for them to want to get back together with you and to restore the relationship. It's not. And they already know that. Most people are stunned to hear that your ex's knowledge of your love is of little importance in getting them to want to get back together with you. But there are ways to get an ex back that have worked even when they were running the other way and have said it's over. There is a legitimate science to it but I'm certainly not talking about being manipulative or playing games. In fact, these things will only push this person further away and almost certainly ruin your chances of getting back with the one you love. The scientific strategies I'm speaking of are actually honest and straight forward. The techniques I can coach you to do accomplish what you want in terms of waking your ex up to see what they are really doing and helps them to see what they are really going to lose if they breakup with you as they currently feel they want to do (and have done). I don't teach you one liners or magic texts to get your ex back fast because they don't exist. An ex won back through such methods would be lost again as easily. What I can show you is far more effective, lasting, and real. You could just keep going at it on your own. You could just keep trying to call or text or show up to their door. It won't work. Why would it? Though it might be difficult for you to hear, what they don't want right now is you, so why do you think giving yourself to them would make them want to come back? You see, you're reacting out of panic and desperation. It's the fight or flight response within you and it will make you do so many wrong things that only push your ex further and further away. Take a breath. There's still time. If I hadn't seen thousands of cases of doomed relationships that were restored, I wouldn't be so calm and confident. You can get your ex back, but I need for you to trust me. And we need to talk. I will listen to your story so that you know I have all of the details and so I can formulate a plan for your situation. I've likely heard most of it before. I can tell you what steps to take in your situation that have been successful at getting an ex to come back - even chase the one they dumped and beg them to take them back. I know right now that sounds like a dream come true. I can help you make it a reality. Click here to schedule a relationship coaching call with me! I'll guide you to get what you want! I've walked this path and I've helped many others on this path. I've spent years educating myself on the intricacies and psychology of relationships and breakups. Not just that, I've coached people to apply techniques and formulas that have brought their ex back to them! It's part of my daily life. I'm happy to tell you that you don't have to wander in the dark, hoping you get lucky! Take advantage of my experience and get back the one you love! It can happen and life is too short to lose them. CLICK HERE To Schedule The Call With Me And Let's Get Them Back! Breathe a sigh of relief and utilize Coach Lee to get your ex back! Don't make a single move concerning your ex until you talk to Coach Lee!